When Sarit Packer and Itamar Srulovich, the couple behind London restaurant Honey & Co were coming to Ballymaloe Litfest in 2015, I took their first book – Honey & Co: The Cookbook – out of the library. Weeks of cooking, numerous library demands and a little incident with the cooker later, I returned the (ever so slightly singed) book – and promptly bought a copy for myself. I took Honey & Co: The Baking Book out of the library a little while ago too. I can see the same borrow-buy situation repeating itself – although I’ll try to avoid cooking this edition. 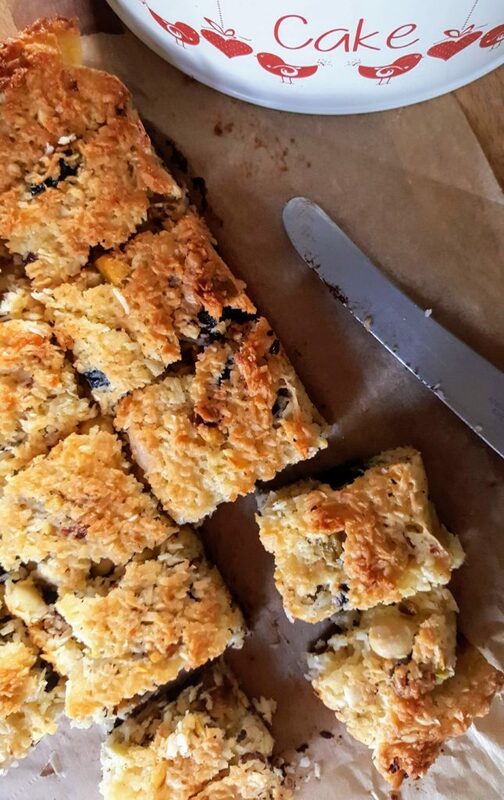 Split into chapters organised around the store cupboard, breakfast, elevenses, lunch, teatime and traditional deserts, there are sweet bakes for all times of the day and more than a few savoury options scattered throughout. Some – deliciously – tread the line between both: simple sesame seed Abadi biscuits to snack on or dip into hummus, jahnoon (a honey-sweetened Yemeni bread that’s served with tomatoes and eggs for breakfast), homemade Pocky sticks with sea salt and fennel. There’s a vegan loaf cake that I have earmarked for the next round of animal product-intolerant visitors, several decadent, syrup-soaked babka, or sweet yeast cakes, and the recipe for the legendary Honey & Co Fitzrovia buns with sour cherries, pistachios and ground mahleb (an aromatic almond-flavoured spice that I brought home from Beirut and which has been in search of a recipe ever since). With two parents diagnosed coeliacs, I’m always on the hunt for sweet treats that we can all enjoy. 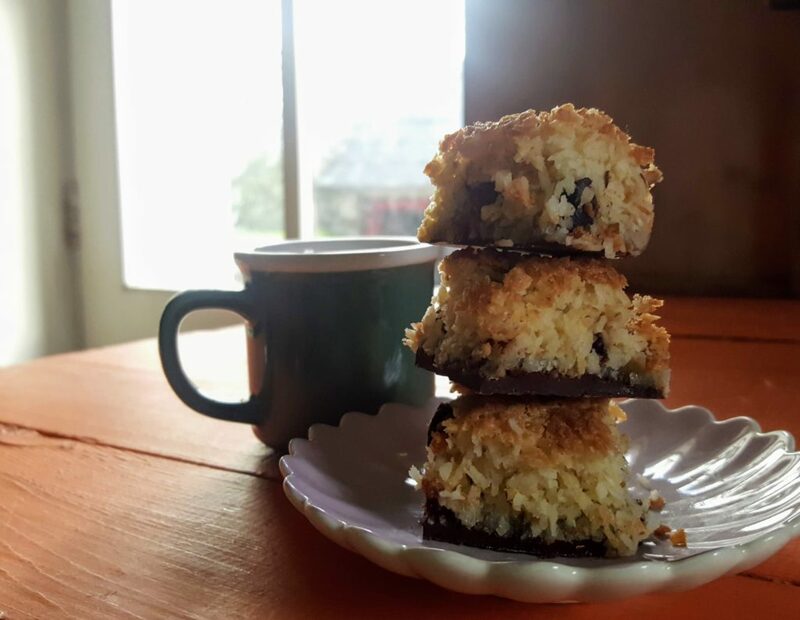 This H&C gluten-free coconut slice has been a real winner, with everyone who tastes it – gluten intolerant or not – requesting the recipe. I’ve also got gram flour shortbread, spiced chocolate and prune cakes and Nutella cheesecake on my GF must-bake list – must be time to hand back the library book and buy my own edition. Do yourself a favour and double this recipe, baking it in two 23 x 23 cm baking tins and distributing it widely. It’s totally worth it. The original recipe calls for dried sour cherries, if you can get your hands on them, and pistachios – ie 50g pistachios / 50g almonds. After two minutes shelling pistachios, I gave up and just used whole almonds, as reflected in the recipe. Makes 20 small squares. 100g dark chocolate – around 70% cocoa solids. Check that it’s gluten free, if you’re baking for coeliacs. 100g whole almonds, chopped roughly. OR 50g pistachios + 50g almonds. Preheat the oven to 190C and line a 23 x 23 cm baking tin with greaseproof paper, ensuring that it overhangs at the sides. Melt the chocolate (I just put it into the lined baking tin and pop it into the heating oven for a few minutes) and spread it evenly across the lined base of the tin. Place in the fridge to set. Mix the sugar, coconut, cranberries, almonds and salt in a large bowl. Add the melted butter and eggs and stir until thoroughly combined. Spread evenly on top of the set chocolate. Bake for 10 minutes, turn the tin and continue to bake for 6-8 minutes until it the coconut is golden on top. Cool in the fridge for a couple of hours or on the worktop overnight before cutting into squares. Store in an airtight tin.